Is Sasha Czack Lesbian ? The American writer and photographer Sasha Czack is popularly known for being the Ex-wife of actor Sylvester Stallone. She has appeared in movies like "Love of Life", "Long Lost Love" and "Vic". Czack was the still photographer and writer of the super hit movie Rocky and is well known for her photography skills. The ex-couple have two children Sage and Seargeoh Stallone. Their son Sage died at the age of 36 due to a drug overdose in 2012. Sasha Czack was born Alexandra Jane Czack on July 17, 1950, in Chester, Pennsylvania, United States. She did her schooling from Chester and enrolled at St. John's senior high school. Czack graduated with a degree in Media Studies from the University of Notre Dame du Lac, United States. Sasha Czack is professionally an actress and director who has appeared in movies and television series. She was cast in the American soap opera named Love of Life which was the series created by Roy Winsor. Czack was also cast in movie Long Lost Love and a short drama named Vic. She was a renowned photographer who used to be known for her incredible photographic skills and talent. Many people used to praise her talent for photography and writing including the famous personality Andy Warhol who was a fan of her work. But later on, she left her career behind to look after her younger son Seargeoh who was suffering from Autism since the age of three. She left her career and started working with the Autistic Foundation. The well-known photographer Sasha Czack is estimated to have a net worth of $4 million according to various sources. She took home $12 million from Stallone as alimony. Sasha Czack is currently single but she had married twice in her life. Firstly she tied the knot to popular actor Sylvester Stallone on December 28, 1974, and the couple stayed together for more than a decade. But the couple couldn't last long and they finally divorced on the love month February 14 in the year 1985. They have two sons named Sage Stallone and Seargeoh Stallone. Their son Sage was born in 1976 and younger son Seargeoh in 1979. Sage was an actor who was cast in some movies and even portrayed his father Sylvester in the movie Rocky V IN 1990. But the couple lost Sage to drugs as he was found dead at his home due to a drug overdose in 2012. Sasha with her ex-husband Sylvester Stallone and her two sons. The family had a difficult time dealing with his death and were heartbroken. Her son Seargeoh had autism since he was three years old and needed extra care. He was treated and after being cured he started appearing in some movies. Seargeoh portrayed Robert Balboa who was a newborn child of Rocky Balboa. After her separation with Stallone, she started dating actor Rick Ash and married him in 1997. The couple tied the knot in 1974 but after living together for 11 years they separated in 1985. They have two sons together. Czack after her separation from Sylvester Stallone got married to actor Richard Ash in 1997. But they couldn't make their marriage last long and divorced after two years in 1999. 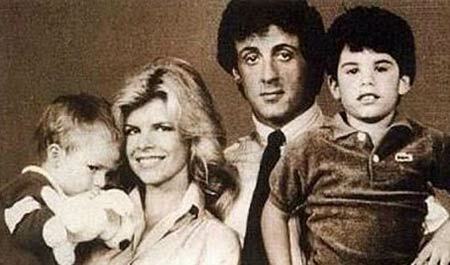 The couple gave birth to their first born son named Sage Stallone in 1976. But in 2012 he died due to a drug overdose. The couple gave birth to their second son named Seargeoh in 1979. He is the second born son of their parents.